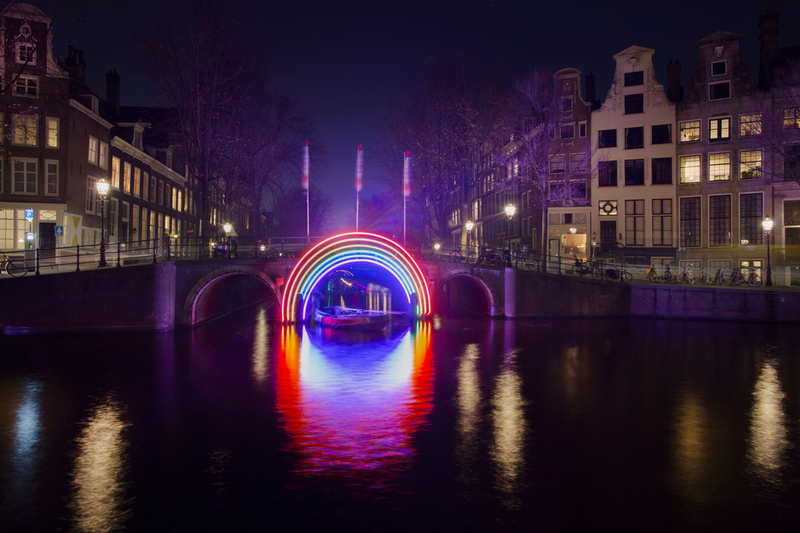 By placing Bridge of the Rainbow firmly in the cityscape, Gilbert Moity makes an elusive phenomenon tangible. The artwork symbolizes open-mindedness and diversity. The colorful object represent the LGBTQIA (lesbian, gay, bisexual, transsexual, queer, intersex, asexual) scene. Gilbert Moity sees light as a source of beauty and life but also as an extraordinary tool. The night is his canvas for expression. The Frenchman aims to create a narrative that transforms urban landscapes and capture the immaterial. Moity has a free and open approach to design, architectural lighting and other artistic installations and public mass events. He often collaborates with various craftsman and researches new technologies and materials that generate new creations. These creations push the boundaries of high technologies.